Those “terrible two’s” got their name from the emotional Xtremes of being two. Of course it all starts at 18 months when your child first says “no” and “mine”. And, if the 2’s are mild and easy-going, then the 3’s come in with even more intensity. There’s just no avoiding the emotional storms of toddlers and preschoolers feeling big feelings and learning how to manage the wilder parts of their developing brains. Daniel Siegel, in his book The Whole-Brain Child, calls this emotional brain the “downstairs brain”. It’s the limbic, primitive brain that manages the basic functions of the body like breathing and blinking but it’s also the instinctive reactionary brain that shouts out the warning signals to fight or flee based on strong emotions like anger and fear. Toddlers begin their journey towards independence with all the demandingness of me-mine-now. It’s the developmental journey from toddlers to teens to create a sense of self while learning empathy, thoughtfulness, compromise and problem solving. To paraphrase Bette Davis, “fasten your seat belts – it’s going to be a bumpy ride.” Parents are here to keep this roller coaster on the tracks. 1. Accept that all emotions are safe. Anger, frustration, impatience, confusion, fear, jealousy and all the other big emotions are disorienting and unsettling. Yet, they cannot be dismissed, avoided, ignored or shushed away. When parents allow children to feel their feelings, children learn that feelings are normal. When parents freak out or try to overprotect their children, children come to believe that there’s something wrong with what they are feeling. 2. Stay connected. Children can easily get lost or stuck in big emotions. Stay connected by staying present. Relax expectations to move forward quickly. Wait for the emotional storm to pass. Show your child you are available if he needs you. You might even say, “I’m here when you need me.” If it helps, be ready with hugs until your child is able to talk or move on. 3. 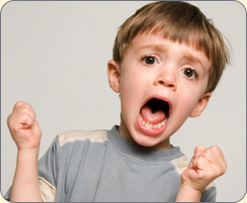 Give your child calming strategy (before or after the emotional explosion or meltdown). For example: deep breaths, belly breathing, blowing out imaginary bubbles, breathing in colors or other calming imagery. 4. Stay outside the emotional soup. You are a peaceful place waiting for your child’s return, waiting for the “upstairs brain” to kick back on. Max, the character in Where the Wild Things Are, needed to know his dinner was still hot and waiting for him after he takes a voyage to the wild things. All children need to know you love them No Matter What, a lovely book by Deb Gliori, even when they are “grim and grumpy”. Children must know that your unconditional love is not shaken by their big, ugly, scary emotions and will never fail them. 3. Through pretend play which requires full use of symbolic thinking as well as flexible thinking experimenting with alternative outcomes and perspective taking. 4. Through games which requires following directions, delayed gratification, strategic planning, skillfully handling age-appropriate disappointment and frustration.